Energy against Trump is growing stronger throughout the country, including on the western slope. 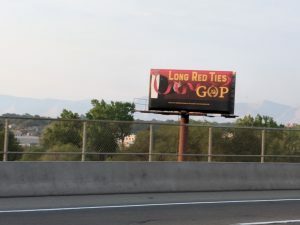 Progressives and liberals in the Grand Valley who were thrilled by the anti-G@P billboards currently up on Broadway/Highway 340 just west of Grand Avenue will get yet another boost of support on Saturday, October 13 when, weather permitting, a huge flying banner that says “IMPEACHMENT NOW” will grace the clear blue skies over western Colorado It will be the first time in local history that anyone can remember a banner being flown over the area. 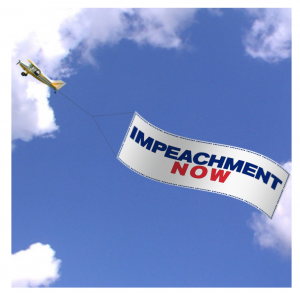 Residents from Grand Junction to Telluride raised the funds, coordinated with Mad Dog Pac (owner of the massive 100 ft. x 30 ft. “Impeachment Now” banner) and hired Drag ‘N’ Fly Banners based out of Ft. Lupton, CO, to fly the banner over both sides of the Rocky Mountains that weekend. The timing couldn’t be better as the mid-term elections will be just weeks away. Citizens hope the banner will energize western slope liberals and progressives to turn out and vote for more sanity in our country’s government. 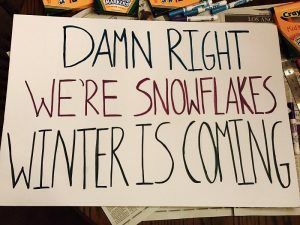 The banner will first fly over Delta starting around 10:00 a.m., then over Montrose, the over Delta again on it’s way to Grand Junction, where it will fly over the Grand Valley for almost 2 hours. It should be over Grand Junction by late morning, around 11:00 a.m., around the time people are getting out for their weekend activities. After the flight, the banner will be packed up and driven to an air strip in Ft. Lupton, Colorado, where Drag ‘N’ Fly will pick it up the next day, Sunday, October 14, and fly it over the Denver-metro area, including swing counties of Jefferson and Arapahoe, and Mile High stadium in the run-up to the Broncos vs. Rams game on Sunday, October 14. 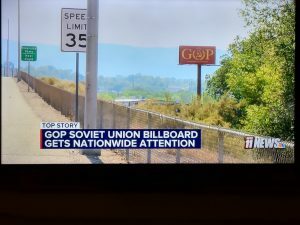 Hundreds of thousands of people will see the banner that day, and the entire project is funded and coordinated by people on the “politically conservative” western slope. Mad Dog Pac is donating the shipping and use of the banner and $500 towards the flights. Western slope citizens from Grand Junction to Telluride pooled their funds to finance the rest of the $4,775 cost needed to pull off the historic banner flight event. Best President we’ve had in a long time. IN only less than 2 years.. Get use to it snowflakes! He is here to stay for another 6 years. waiting for salvation? its here already - grab a mirror. The message will not be heard if it isn’t spoken in the Sunday sermon. Then again, the church relies on its propagandic stories to keep the ignorant ignorant about themselves, and waiting for salvation. Conservativism IS that very FORCED/INDOCTRINATED tribal ignorance. Their entire orientation demands and relies on uptake of its closed-loop system. “Certainty” is NOT the human condition, yet the ignorant demand certainty and its’ helplessness: helplessness is an absense of options, and having no options is certainty. Glad you are doing this. Thank you.